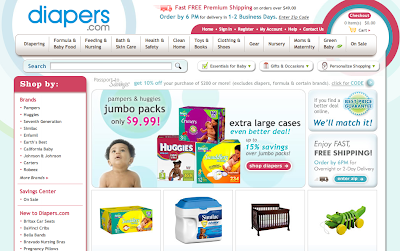 have i mentioned my love for diapers.com? they have all kinds of baby stuff (not just diapers), and if you order before 6 pm, there's a good chance you'll get your order the very next day! what? yes. the next day. for free. what? yes. free overnight shipping if you spend $50 or more. yesterday morning i ordered some newborn diapers (so tiny! can't wait to see that little bum!) and some stuff i'll need for milking. i just looked at the tracking and a mere 24 hours later it's in des moines, out for delivery! i got $2 off the diapers, free shipping and another 10% off. crazy. why don't you just pay me to shop. am i overreacting about the greatness of this website? if i am, it's because i've already been up for 3 hours and i've had too much coffee. yes, i'm pregnant and i still drink coffee. i've also highlighted my hair at least once a trimester, been spray-painting everything within reach, and have enjoyed the occasional glass of wine. oh, and when i take vitamins, they're gummy vitamins. I LOVE diapers.com too! I was so surprised when I ordered diapers one night and they were on my doorstep the next morning!!! umm...yes diapers.com is the greatest site. They also accept diaper coupons! I order from them atleast once a month, usually more though! you are a pregnant girl after my own heart! i too drink coffee almost every day (otherwise I'd have to resort to heavier drugs to keep up with my children in this HUGE state that I find myself in). and the prenatal vites lasted about the first month. let's hope this baby doesn't have 3 arms! i echo emily's sentiments...you are preggers after my own heart too. it is funny how everything is on a sliding scale with baby #2 and beyond.